SNet Leased line is a highly reliable, flexible, high speed solution which offers dedicated and guaranteed bandwidth for your network needs.SNet Leased Line delivers a business grade solution for mission critical applications and is ideally suited for converged video, voice and data applications. Snet Leased Line enables customers to deploy high speed networks based on Ethernet technology in metropolitan areas. It delivers up to 1Gbps of guaranteed, symmetric IP throughput with 1:1 contention and 99.95% network availability. SNet Leased line allows our clients to future proof their network and minimize capital expenditure. The ability to provide Internet connectivity over Ethernet Access has been available for a long time, but now with the extensive fibre capacity available, this access is becoming the most cost effective way for customer sites to achieve high-speed reliable connectivity to the Internet or to their private networks. This access is also the most common way of accessing the new Layer 2 ELAN and ELINE type Point to Point and Point to Multipoint networks. Currently, the services are available in and around the cities, with reach extending to metropolitan areas and business centers and some major regional towns. Please consult with SNet on availability at your location. Speeds start from as low as 1Mbps and are most cost effective where access speed is 10Mbps or higher. SNet also offers alternative solutions where speeds below 10Mbps are required. Standard metro-area switched Ethernet service with standard Ethernet performance and reliability characteristics. Suitable for businesses requiring high speed at a cost effective price point. Where reliability and link performance are critical, Ethernet over SDH (sometimes refereed to as Ethernet over SONET) is the appropriate option, providing a link with 1:1 contention and an option for fibre circuit protection, so that no single fault would result in service downtime. Service deployment is typically based on a minimum 40 day lead time as fibre installation to your premises and network bandwidth planning require time to design and implement. Expected lead times will be defined once initial design and feasibility are completed. Who is SNet Leased Line Service aimed at? SNet Leased Line data service is a premium product aimed at business customers demanding a fast, reliable, scalable and cost effective solution. The service is fast, reliable and has enough capacity to be shared by a large number of users. Do I need a firewall with SNet Leased Line Service? If using a SNet Leased Line service to connect to the Internet, SNet would always recommend a suitable firewall and security solution be used. Please consult SNet if you would like assistance with your security needs. Is an SLA provided as part of this service? 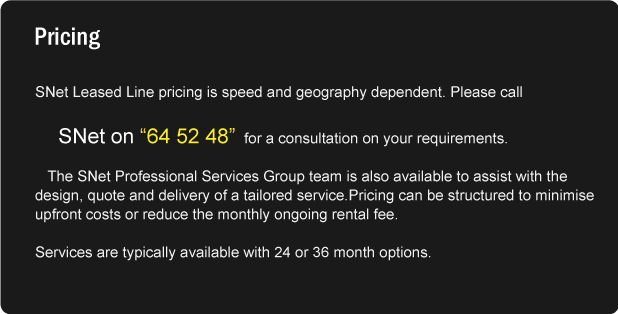 Yes,SNet provides a comprehensive SLA on SNet Leased Line. What kind of applications does SNet Leased Line support? SNet Leased Line can support point-to-point link and point-to-multipoint configurations. Snet Leased Line can connect your sites to the Internet, provide site-to-site LAN bridging or routing or connect multiple sites into a metro or wide area network. Is Ethernet easy to integrate? 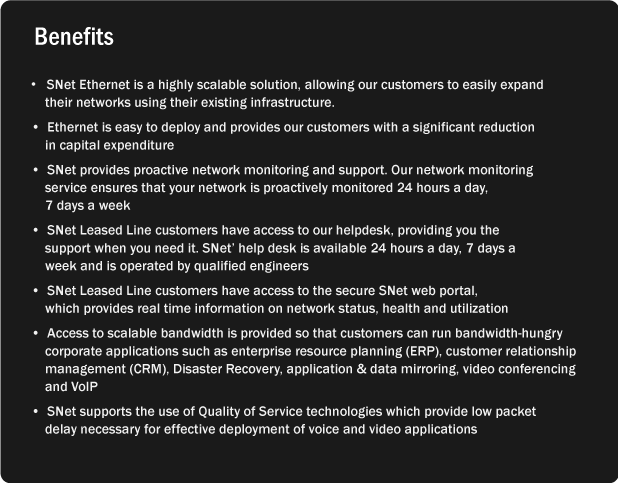 SNet Leased Line connects to the customer’s network and equipment using standard Layer 2 Ethernet protocols and interfaces and is easily integrated into corporate local area networks (LAN's). It is also well suited as a high-speed access option to connect to SNet Internet and simply connects to your existing router or firewall using Ethernet interfaces. How much does SNet Ethernet Cost? Please contact our Corporate Business Specialist by phone on 249 248 or contact at Your Nearest Branch.